We tried two methods of planting this year. First we put some in the existing vegetable patch where we still have a small amount of room. Then, next to the vegetable patch, Richard mowed the grass down and we have tried the permaculture no-dig method, which is growing potatoes under straw. The no-dig method is different from the traditional way of digging little trenches in the soil for your spuds. Funnily enough though, the only bit I actually managed to help out physically with was the trench digging. By getting on all fours and dragging my pregnant belly along the soil, massive trenches were rendered easily for the spuds. No? Ok, I used a trowel! I thought this was still rather impressive four weeks out from giving birth and makes me feel like I can cut it as a potato farmer if I ever need a career change. I must admit that it was nice to get my hands dirty for a bit because Richard had to do all the hard work on the permaculture patch because by the end of my trench effort I was exhausted. I’m not good at being hands-off so I appreciate Richard’s efforts while I sat around in the sun like a sloth, reading out the planting techniques. Permaculture is still experimental territory for us but I’m learning more and more. See the photographs below for how we did it. Warning- we are new to this technique – this is how we did it and we’ll let you know the results in about 4 months! Will we have created gourmet potatoey eating ecstasy, or green toxic hand grenades? 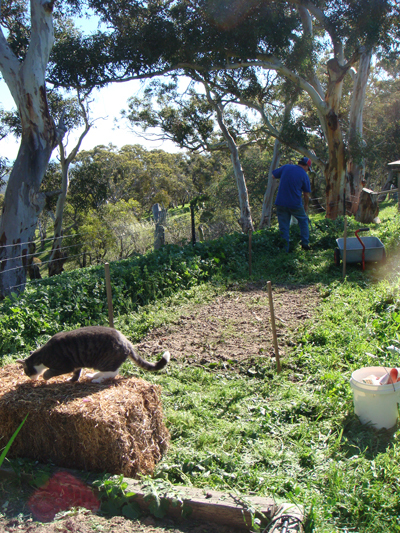 Assemble your potato planting team – in this case my lovely husband and trusty cat, Gandalf. Mark out your area (mow if you need to) and put a layer of manure directly on top of the mown grass. We used chicken manure because we have a good supply. Wet the manured area. Put down some thick newspaper on top of this to suppress the weeds. Wet the newspaper so that it doesn’t blow away. 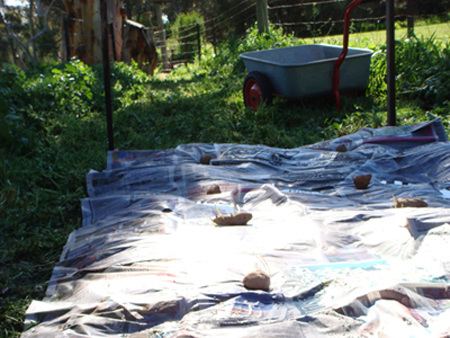 Put your seed potatoes directly on top of the layer of wet newspaper about 30-40 cms apart. Add a thick generous layer of straw (we used pea straw) to cover the potatoes. Imagine the seeds as little vampires – you have to make sure that they never see the light of day, otherwise you will end up with green poisonous potatoes – so don’t skimp with the straw. 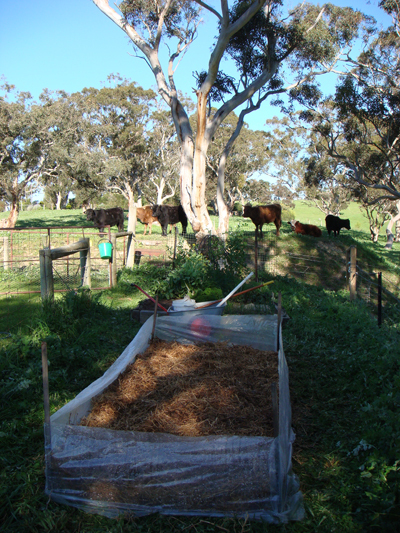 (We used one large bale of pea straw for the patch.) Continue to build up the layerwith manure, blood and bone and anything else organic that you have available. We had some freshly bought mushroom compost and some home-made compost/manure. 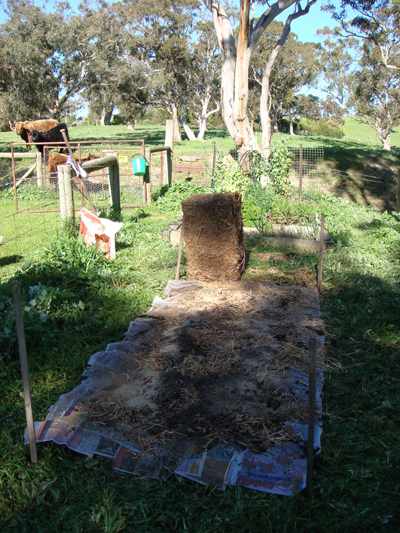 Finish off with a final layer of straw as shown below and water well. You should aim for a total layer of about 40 cms deep. As the plants grow you just need to ensure that you add more straw or organic materials (e.g. 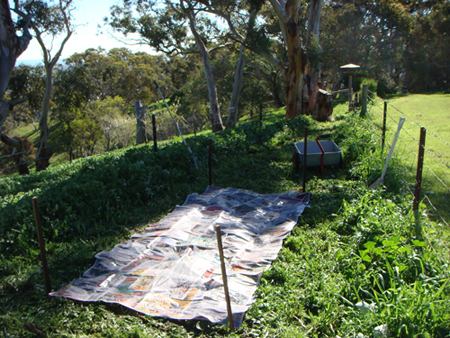 grass clippings) to keep the light away from the potatoes as they grow. As we have quite a windswept location, we also pegged out a bit of plastic to keep the pea-straw in situ. Keep the pea straw moist so that it can rot down and feed the lovely manures down to the potatoes in their dark seedy underworld. Harvesting the spuds is apparently very easy as you can just rummage around under the straw and manure and find those hidden ‘apples of the earth’ beneath.